2point0 starring Superstar Rajinikanth, Akshay Kumar and Amy Jackson in the lead roles under Shankar's direction has wrapped up post-production works and is set to hit screens on November 29 with the teaser coming out on September 13. 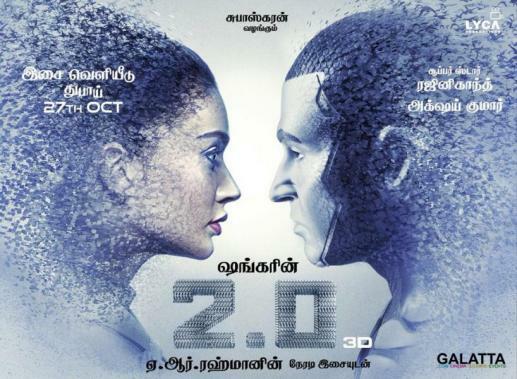 Recently, sound designer of the 2.0, Oscar Award winner Resul Pookutty tweeted saying the sound department has done their job in this film and fans will finally get to witness entertainment from 'Superstar' Rajinikanth. #2pointO #2Point0Teaser mixed, masteted and delivered! Meet #Thalaivar @rajinikanth in the cinemas in 2days! 2.0 has been shot in 3D with the teaser set to be released in 3D too. Let's keep our fingers crossed and wait for it! >>Amy Jackson to get hitched - Wedding details are here!